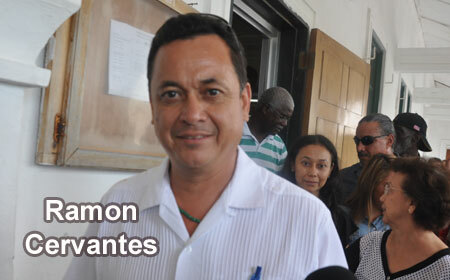 BELIZE CITY, Fri. Sept. 18, 2015–The slander lawsuit brought by Deputy Prime Minister Gaspar “Gapi” Vega against his political opponent, Ramon “Monchie” Cervantes, Jr., continued in the Supreme Court of Chief Justice Kenneth Benjamin today. Vega brought the lawsuit against Cervantes and Fiesta FM, claiming that a broadcast from that station, which the Cervantes family aired, slandered his reputation. The allegation is that in the broadcast, Vega’s name was mentioned by Manuel Castillo, who is wanted by police for allegedly masterminding the murder of the senior Cervantes, in a phone conversation with Cervantes, Sr.’s widow about the murder of her husband, Ramon Cervantes, Sr.
From the beginning, Vega has denied all involvement in the matter. At the trial today, Cervantes took the witness stand and told the court that it was his family who decided to air the broadcast, and that they did so without telling him, since they did not want him to relive the memory of his father’s decomposing body. Vega’s attorney grilled Cervantes in cross-examination for over three hours, during which time Cervantes told the court that he was not the one who had planned nor authorized the recorded conversation to be broadcast on national radio. Williams continued to grill Cervantes about the truthfulness of his story, but Cervantes stuck to his position. During the evidence phase of the trial, the actual recording of the statements made by Castillo was never played for the court to hear. In fact, the actual recording is in the Spanish language, but the court’s official language is English. Furthermore, there appears not to be a copy of the actual conversation that was purportedly aired on Fiesta FM. Vega’s side has a copy of the broadcast that was aired on Love FM, but they could not get that admitted into the evidence against Cervantes. Now that the evidence phase of the trial has concluded, it is doubtful whether the actual recording will be played for the court, because that is not a part of the evidence that the plaintiff, Vega, was able to get admitted in the trial. Upon exiting the courtroom, Eamon Courtenay, SC, who is the attorney for Fiesta FM, told reporters, “In order to prove a libel, you have to prove the document – for example, a book or a letter or some writing, or in the case of television or radio, some actual recording. You will recall that on the last occasion that I spoke to you, I said that they had tendered into evidence a recording from Love FM. “In those circumstances, it is our view that it is unlikely that the Chief Justice is going to give a judgment in their favor. But as you know with these things, we have to make our submissions to the judge and he has to consider all the evidence and make a decision,” Courtenay said. The case has been adjourned to October 16, when the attorneys will make submissions to the Chief Justice, who will have to then rule on whether or not Cervantes slandered Vega.